Danny Taylor was the Rotarian of the Day. Danny guest was Leslie Schaffner, the recently hired President of the Wichita Falls Area Community Foundation. http://www.wfacf.org/ Leslie gave us a great preso on the work of the foundation. The Endowment of Grace Ministries is just one of the 278 funds managed by the foundation. Today we hosted three Burk High School students to compete in our annual four way test speech contest. Some friends came to judge the contestants. Mike Tugman was the Rotarian of the Day. Mike's guest was John Gillespie, the new District Attorney. John is from Burkburnett and is a Rotarian in Wichita Falls. He gave a very engaging presentation about the DA Office and his vision for the future of the office. John's father was a member of the Burkburnett Rotary Club and was a former president. John got a great work ethic from working with his father, who was a pharmacist in Burkburnett. Don Pellikan was the Rotarian of the Day. Don's guest was Mark Beauchamp, county commission for PCT 1. He gave us an update on the new County Jail and Sheriff's office, and other county business. Rod Ryalls was the Rotarian of the Day. Rod's guests were WFFD Chief Jon Reese and Assistant Fire Marshall Jaren Burchette. They spoke to us about the assistance they gave to the California Fire Fighters during some of the recent wild fires out there. Matt Patterson was the Rotarian of the Day. His guest was Tom Talbert, MD. Dr. Tom is working with a new treatment clinic that deals with opioid addiction, what used to be known as a Methadone Clinic. The opioid addiction is a real scourge in this country. Over 30,000 young people overdose every year. Many have lost jobs, families, friends, and health as they spend $500 or more a week on their habits. Before becoming associated with the clinic Dr. Tom did a lot of research. He found that many saw the Methadone clinics as a crutch, which trades one addiction for another. Dependency and addiction are different things, and those with dependency are not necessarily addicts. Addiction is caused by a mental disorder. We have a pleasure / reward system that is built into our brains. 10% to 15% of the popluation have a disorder that makes this process out of control. It is primarily inherited, and if both parents have the gene for addiction disorder, a child will have 75% chance of developing addiction. It is not a moral choice, but a mental disorder that must be treated as such. Craving something is a normal thing, but an addiction can develop, so methadone allows the treatment of the craving and disorder without giving a feeling of being high. Combined with counseling, patients can recover and break the cycle of pleasure / reward system of drug use. Brad Owen was the Rotarian of the Day. He presented to us information on a new app for student and staff use to report bullying, or other emergencies. Also, the officers of Student to Student, which reaches out to new students, who came to tell us about their program. Keith Myers was the Rotarian of the Day. HIs program was a presentation about several of the foreign exchange students who are in our schools this year. We heard from kids from Denmark, Germany, South Korea, and Spain. We learned about some of the differences between their home countries and the US. One thing they all found out was different here is that the teachers were very friendly, and they got to know their names. He heard about how the students and families are put together, and how much the families are supervised. John Munson was the Rotarian of the Day. His guest was his bride, Laurie Munson, who displayed the icons that she has written, and gave us a history of iconography. Today we were honored with a visit from our District Governor, Gerald Robinson. Roger talked about what the club is doing in the community. Danny Taylor was presented his Paul Harris Fellowship plus 5 pin, showing that he has raised $1000.00 for the Rotary Foundation for each of the last five years. Christina Haworth was the Rotarian of the Day. Her guests were Shannon and Jack Miller who began a project called "Blessing Boxes." 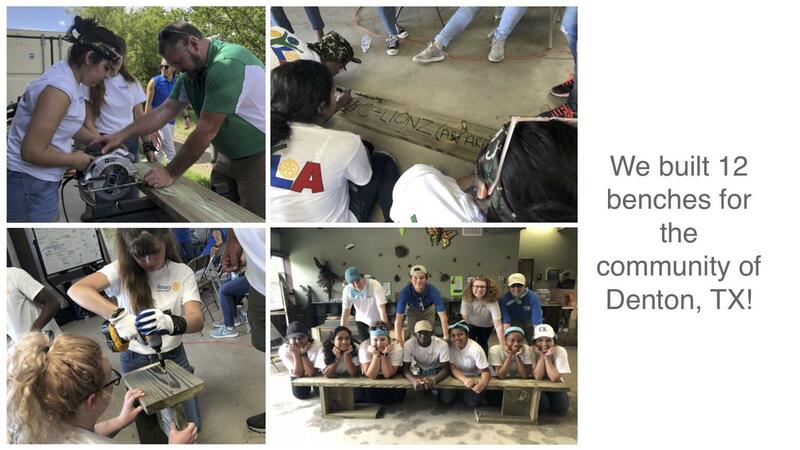 Two of the boxes have been placed in Burkburnett, one at the community garden, and one at St. Jude Thaddeus Catholic Church. Guy Duke was the Rotarian of the Day. The program was a tour of the new Burkburnett Justice Center by Chief Ed Stahr and Lt. Lahoma Vaughn. Roger gave us a summary of the Texoma Gives campaign. Rotarians of our club are involved in many charities in our community. Danny Cremeens was the Rotarian of the Day. Danny's guest was Mike Tugman, CPA, who gave us facts on the current tax laws. The top earners, 1% of Americans, pay 43% of the taxes collected, the wealthy do pay taxes. For 2018, only the first $10,000.00 of sales taxes paid will be deductible. Mortgage interest deduction is reduced from the first $1,000,000.00 to $750,000.00. Deductions for employee related travel and expenses has been eliminated. Brokerage fees are no longer deductible. The standard deduction was raised so that fewer tax payers get more than that. Alimony will no longer be deductible. There are many more changes, go ask your own CPA. Tim Cornelius was the Rotarian of the Day. His guest was the new athletic director and football coach at the Burk High School, Jason Meng. Jason gave us a great view of the motivation program he is using to bolster the players toward excellence. It was very impressive, and we really enjoyed his presentation. Our guest today was Kim Fagan, Program Coordinator of First Step, Inc. This is a nonprofit organization based in Wichita Falls which provides free, confidential and comprehensive domestic violence and sexual assault services. Kim will be accompanied in her presentation by Executive Director Debra Dyason. http://www.firststep.org First step has a 24 hour safe haven including food, clothing, transportation, and case management to help survivors reclaim independence. They offer individual and group counseling, legal advocacy, a children's program, professional training and educational programming. The 24 hour crisis hotline is 800-658-2683. At our meeting today, our RYLA attendees Taylor Vaughn and Haley West. They told us about the great time they had at the meeting. Roger talked to us about membership matters. Inviting prospective members to lunch is a great way to acquaint them to Rotary. 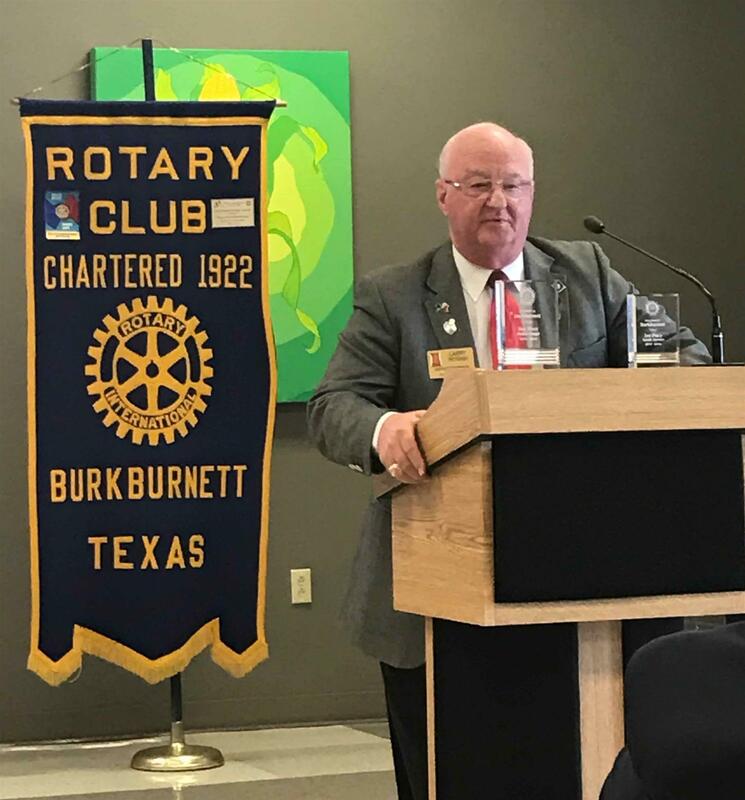 Danny is a 5th generation resident of Burkburnett, and has been a Rotarian for 35 years. He showed us a picture of his Great Grandmother and her father, in front of the house that was built for her, and which still stands West of Burkburnett. Keith Myers was the Rotarian of the Day. Today we toured the new Elementary School. 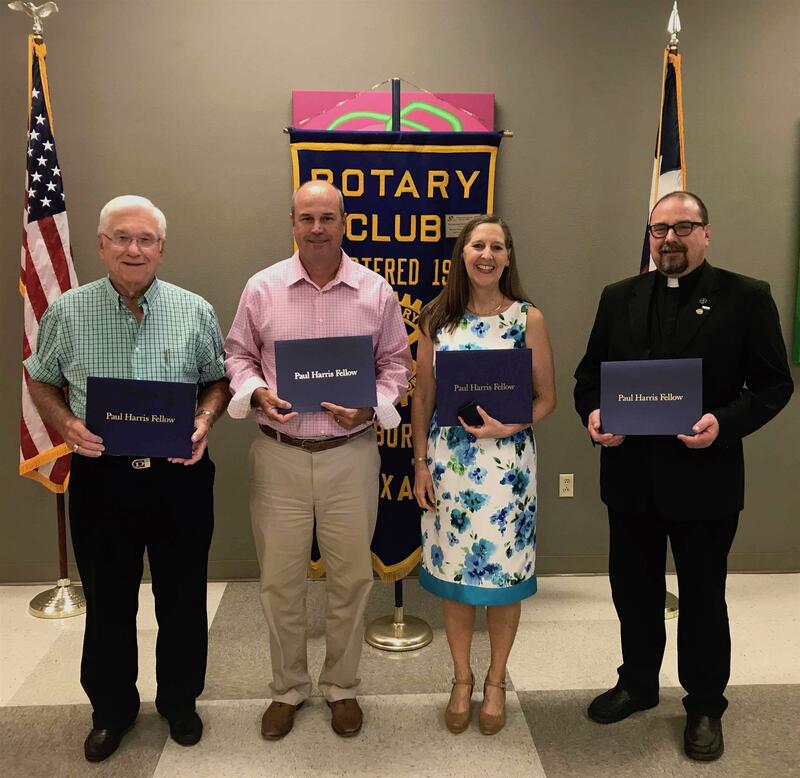 Wayne Methvin was formally admitted into Rotary International and this club. Welcome Wayne! 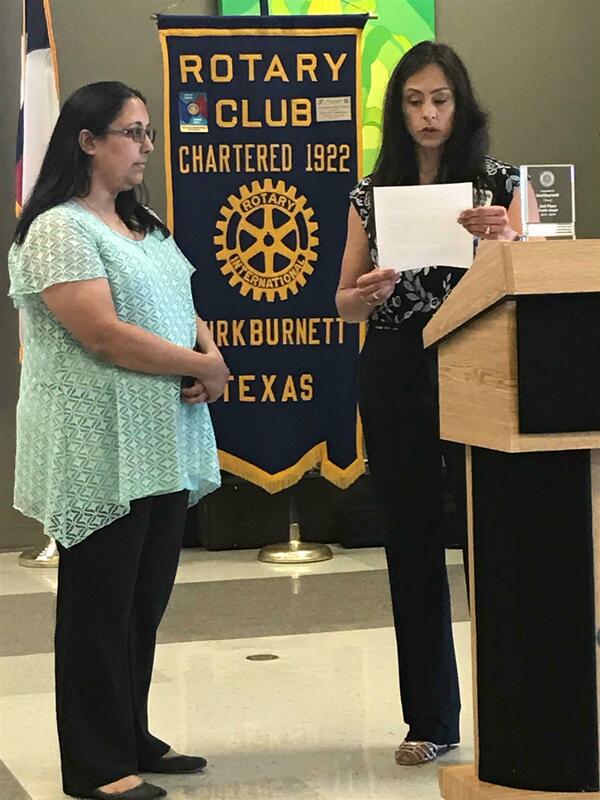 We also welcomed new Rotarian Mariam Torres.